“As every cat is different, we adapt our approach according to each animal’s background, temperament, needs, and ultimately his or her own choice of new owner or family.” Charity Cofounders. All our rescue cats and kittens for adoption are available for viewing at the charity’s Market Weighton homing centre. Our re-homing procedures have been set with the benefit of years of experience finding the most appropriate homes for each animal. 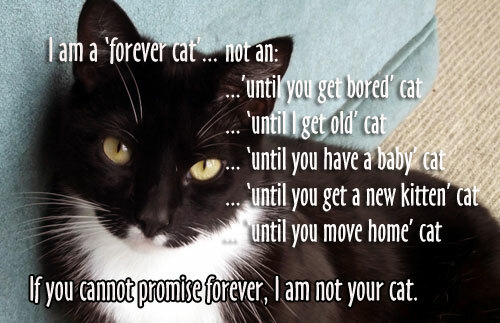 Some of our rescued cats have never known a loving home, and some may have had bad experiences of humans; others may be sad to be apart from their owners and are broken-hearted. Please show respect and due sensitivity to the cats & kittens in their pens when you visit. This is a two-way process so people are encouraged to ask as many questions as they need. What is most important is matching the cat’s personality with the family and their lifestyle – please do not make a choice solely on colour. Getting these factors right makes for the happiest and most successful animal adoptions in the long-term. If you have children please bring them with you so we and the cat can meet them, and we can assess how they interact. We encourage adopters to make as many visits as they feel necessary to ensure the adoption outcome is the most appropriate for all concerned, but particularly the cat. People can also preview adult cats for adoption in our online gallery which we endeavour to keep as up to date as possible. Do also read our article on ‘Choosing a cat or kitten?‘ to help you decide which age group is best for your home circumstances, as well as our piece on Colour bias in cat adoptions. The financial responsibility of owning a cat that may live up to 20 years – annual costs often exceed £1100 per cat: quality food, monthly flea/worming treatments, insurance premiums, vet visits for sickness or accidents, annual booster vaccinations, boarding fees, toys/bedding etc. Remember these costs can escalate as your forever cat gets older! Your personal/family circumstances – if you have the time/space/physical ability to properly care for the animal (incl maintaining an indoor litter tray); your working routines and provision of holiday care; any family allergies or illnesses that may be affected by pet dander? Your home circumstances – if you own or rent your house or flat, is it on a main road or in a city centre? will the cat be indoors or outdoors, how will you ensure its safety & welfare? Your other pets, if any, or young children – how will they get on together? In adopting a cat or kitten from us, we will ask you to undertake to keep your cat inside for the first 4-6 weeks, to ensure the animal recognises your house as its new home. If you have an outdoors cat, we stipulate that it must always be kept inside after dark. It is in the dark that most cats are injured, stolen, fight or are hit by cars. That means we are asking you to undertake an indoor litter tray for life! We ask for an adoption fee of £85 (non-refundable) that will help us to pay for some of the costs of the treatments your pet will have had. People who have, or have had cats, will already know that it costs a MINIMUM of £180 to blood test, neuter, vaccinate, microchip, worm and flea-treat your cat or kitten. What treatments have the cats received? Summary: All cats and kittens are homed with our peace-of-mind 7-Step Health Check. Each animal will have been blood tested for FIV (feline immunodeficiency virus) and FeLV (feline leukaemia) and one of our supporting vets will have carried out a comprehensive health check. Your pet will have had effective flea and worming treatments and will have been microchipped. All adult cats will be neutered. Kittens that are too young to be neutered before they leave the charity should be taken to one of our supporting vets to complete their treatment. This is pre-paid ONLY if you use one of our supporting vet practices – the Swanbridge and Battle Flatts practices. In addition, your cat will be covered by FREE insurance through the charity’s recommended insurer Petplan for the first four weeks after adoption. You will also benefit from being able to take out Petplan’s Covered for Life policy option, even for older cats. Certain terms and conditions apply which can be discussed with the homing volunteer. FIV/FeLV testing: All our cats are blood tested for FIV and FeLV which we consider essential for the longterm health and welfare of each animal. While these diseases cannot affect humans or other species, to cats these are deadly and incurable diseases which will cause misery and suffering. Feline Leukaemia is spread between cats in bodily fluids, including saliva, so it is essential to adequately protect your pet by ensuring that this vaccine in included in your pet’s annual booster. There is no vaccination for FIV. It is caused by blood contact (typically bites) and mating and therefore the best precautions are to neuter your cat and to keep it indoors at night as this is the time when most fights between cats occur. Vaccinations: We vaccinate all our cats and kittens against four life threatening diseases. These are feline enteritis, cat flu and feline panleucopenia which are given as a group in one vaccination pre-fixed with the name “tri”. 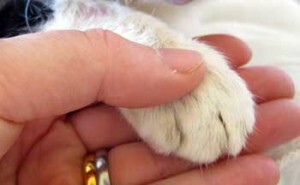 A second vaccination is given for the fatal disease feline leukaemia. Our vets will put both vials of vaccine into one syringe so that your cat has only one injection but will be vaccinated against NOT only three but all FOUR of these potential killers. The cost to us is financial but the ‘cost’ to your cat is life threatening. You will be given the proper vaccination record card showing all vaccinations and boosters. If your cat has to go to board at a cattery, e.g. whilst you are on holiday, any reputable boarding cattery will request to see this record of vaccination. Veterinary treatments: All of our cats and kittens have their own personal booklet that contains the details of all its veterinary treatments as well as a record of the dates of flea and worming treatments. If your cat or kitten has had any obvious problems, don’t be afraid to ask the homing volunteer about any treatment. Remember, when you take it home it will be your cat and it will be your responsibility to monitor its health and prevent any unnecessary suffering. We offer a great value bundle of cat care essentials for your new cat or kitten: Sturdy cat carrier, food & water dishes, litter tray, litter rake, plus 2 small toys – all for just £26. A 25kg bag of our recommended clumping cat litter is an extra £6.50. We also sell a wide range of cat accessories, including scratching posts, activity centres and climbing frames, cat beds, water fountains, interactive toys/catnip, safety collars, grooming aids, Feliway anti-stress products and fur ball treatment. We regret we are unable to sell food, flea or worming treatments. 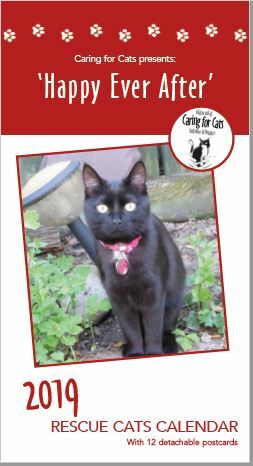 You will be given a useful leaflet of hints and tips on looking after your new cat or kitten once you get home – this document answers many questions first-time cat owners often have. The charity coordinator is also very happy to give telephone advice on any problems being experienced. We offer as much support to new cat owners as they require. Any cats that do not settle with their new owners after a sensible period (not less than 4-6 weeks) will be taken back when room becomes available. This will be on agreement of the coordinator. Please take note that the adoption fee is considered a non-refundable donation. Should owners’ circumstances change at any time in the future, and they are no longer able to keep the cat, we request that it be returned to us, with adequate notice. “Once we accept a cat into the charity we take lifelong responsibility for it. We request the animal be returned to us should the new owner genuinely ever become unable to care for it” Rose.